Position and Employer: Risk Analyst, Radian Guaranty Inc. 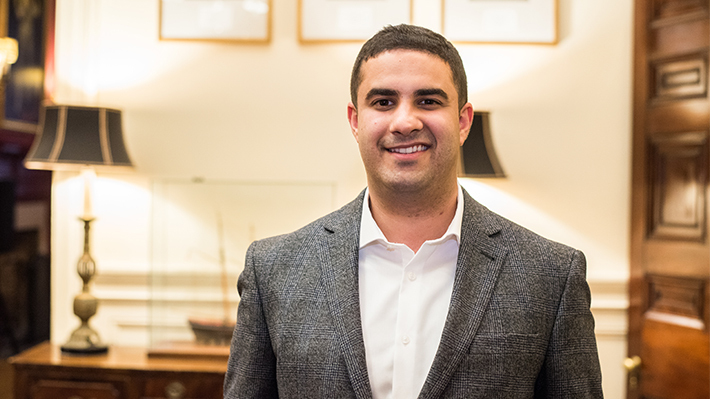 When Soheil Kashan came to Drexel in 2013 to enroll in the Master’s in Finance program, he had never visited the United States – much less Philadelphia or Drexel’s University City campus. “I don’t want to say it would have been impossible, but it’s close,” he explains. Soheil is originally from Iran, where he completed his undergraduate degree in finance at the University of Tehran, and travel between Iran and the United States is restricted due to ongoing tensions between the two countries. Still, Soheil’s sister came to the United States for her medical school residency and ended up obtaining U.S. citizenship, which helped encourage his idea of coming here to study as well. After first coming to the US on a student visa, he now has a sponsorship for an H-1B visa by his employer. He advises international students, regardless of their area of study or their home country, to keep up on current events and the policies of both the U.S. government and major companies in their target industry. “Sometimes, information is basically nowhere, and year over year they might change their policy,” he says, adding that at Drexel, the Office of International Students and Scholars Services was a valuable resource, answering his questions as he applied, was accepted and moved here.